There are big changes on the horizon for car manufacturers. The market is becoming increasingly competitive, and OEMs and major tech giants alike are investing billions to develop new and groundbreaking automotive technology. Autonomous driving and electrified cars aren’t far away concepts anymore. In 2016 there were 2 million electric cars on the road worldwide. By 2030, up to 15 percent of new cars sold could be fully autonomous. 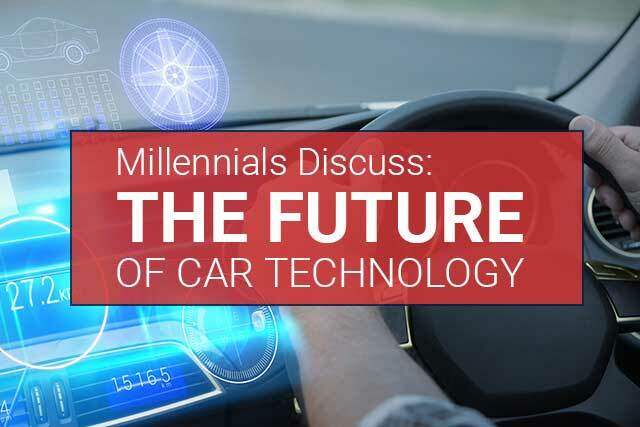 Millennials are the largest generation alive today with increasing car-buying habits, and they will be a key audience for the next wave of automotive technology. Industry players are wondering how Millennials will respond to the new trends. What concerns do they have, and how accepting will they be? We interviewed some Millennials in our office to find answers. Do you feel brand loyalty to your current car? Why or why not? Shannon (2010 Hyundai Elantra) – Not necessarily, though I wouldn’t be opposed to buying another Hyundai. It would probably be one of my top 3 if I wanted to get a new car, just because of price, and it’s been a good car quality-wise. Sean (2002 Subaru Impreza Outback) – Somewhat. I feel like Subarus are good versatile cars, fun to drive and can handle all sorts of terrain and weather. Zeke (2006 Toyota Corolla and 2010 Honda CRV) – Not necessarily. Although they’re two of the better manufacturers and price value, I would still be open to another car for the next one because I don’t see the point in being loyal to a particular brand. K (2009 Mazda 3) – I just want a car that has good gas mileage. Clara (2016 Subaru Outback) – Yes because my very first car was a hand-me-down Subaru that had been running forever. And because the commercials have dogs in them. Are you currently in the market for a new car? If not, what kind of life event would put you in the market? Shannon – Not right now. The only reason I’m buying a new car is if my car gets totaled, or if my husband and I have triplets. Sean – Yes, I’m in the market. My current one has high mileage and will start costing more money in repairs. I have been looking for another Subaru, and I’d like to find something under 100k miles and in good shape. I’m also looking at other makes, but will probably end up with another Subaru. Zeke – No. A wreck would force me to. God forbid I have more kids, but we’d need a new car then. If I made a ton more money all of a sudden, maybe twice my current income, then I would consider trading in the older car. K – No, I promised myself I wouldn’t get a new car until I turned 30. My car is still good, I haven’t had any issues on it. The only way I’d be in the market is if I won the lottery. Clara – I recently bought a new car because of the Volkswagen recall, and I had the opportunity to have a better commute. What are your “must have” features when looking for a new car? Shannon – Cruise control, power windows and locks. I want to play music from my phone, whether that’s bluetooth or just plugging in my phone. Maybe a GPS would be nice so I’m not having to do it on my phone, but I can get by. Sean – I want something fun to drive, spacious, usually a wagon or something I can fold the seats down and put larger items in. Typically manual transmission or paddle shift, something that lets you change the driving style. I have nothing technology-wise right now, but I’d like good bluetooth, hands-free, and buttons on the wheel. Clara – Basically just good gas mileage, and having a decent sized trunk. What are your thoughts on electric vehicles? Would you buy one? Why or why not? Shannon – I would buy one if they had proven themselves reliable. I don’t really know much about what’s out there. If it had a longer distance capability, I would be more inclined because then I wouldn’t have to worry about charging it. Sean – From what I’ve heard and researched, they’re not necessarily good for environment. They still have to mine all the materials for the battery, and then ships have to carry the materials across seas and they’re polluting to get the batteries over here. I don’t think the whole population can switch to electric, it’s not good for environment. Electric vehicles also have short range. The only one you could take on long trips is a Tesla, and that’s not in my price range. Others have only a 60-80 mile trip length and then you have to recharge. It’s not practical if you have to commute. Other technologies like hydrogen might be good, but there aren’t enough places to get hydrogen quite yet. Zeke – Currently I don’t think they’re competitive enough, but I think that will change. Once they become competitive with gas vehicles, to the point where it’s almost a no-brainer to get an electric one, then I think that would be the right time. Right now it’s just a novelty item that doesn’t save you much money. Some gas models out there right now get similar mileage. K – Not electric, not right now. What if I move somewhere with no charging capabilities? Clara – If there were more charging stations or the battery lasted longer, I would buy one. I think electric vehicles should be more prevalent than they currently are. What are your thoughts on autonomous driving? What are your concerns, if any? Shannon – Yes I would buy one. I have a little bit of road rage and I get frustrated easily with other drivers, so with autonomous driving I could do whatever I wanted to do. In order for it to be most successful, most people would have to own an autonomous vehicle. Because I don’t know how those cars can predict behavior of human drivers in other vehicles. I’m sure people designing them are thinking about that, but we can’t predict other people’s behavior. My cousin’s wife works in that industry, and I know they’re trying to take into account as much as possible. Sean – I would consider it. I think it could open up opportunities for more vacations on the weekend, where you can relax while the car drives. It would also open up opportunities to take further jobs that you don’t want to commute to and deal with the traffic. However, I wouldn’t want to because I enjoy driving to a certain extent. I would miss that freedom aspect. My concerns: I feel like with anything tech related there will be incidences of accidents or death. The first death with a Tesla happened when it was self-driving, so they had to cap it at 40mph when the car is autonomous driving. It’s probably safer than humans in the end, but there will be instances where people will slow down production because they question the safety. Zeke – I think that’s the future. I’m definitely excited to see it get competitive too, which will probably happen along with electric cars getting competitive. I don’t have any concerns. At the end of the day, our software is at a point where it’s better than humans at most tasks, including driving. K – The only way I would is after everyone else has the car. The infrastructure has to be there to support everything, and everyone has to be in those autonomous cars in those areas. Someone driving a manual car could cause an accident to happen. Clara – If all of them were automated, yes. It would be really cool, I don’t like to drive. Malfunctioning would be the main concern for me. In an ideal world, how would you want to shop for a car? Shannon – I’d want to shop online and have it delivered to me, so I could test drive it. And if I didn’t like it I could send it back. Or I could keep it! I don’t really want to deal with car salesman. Sean – Probably where I could pick different brands and makes and have them all come together in one area where I don’t have to drive around to different dealerships and go through hassle of talking to a bunch of salespeople. I can pick models I’m interested in, have them meet me in one area, and get 30 mins with each vehicle I’m interested in. Also, with a VR headset, you could look around the interior of a car you’re interested in. That’s what’s most important. You spend the most time inside, so the outside doesn’t matter as much. Zeke – I would like to shop online and once I had figured out a group of 3-5 cars, the OEMs would bring the cars to my work individually, and I’d test drive them on my lunch or something. Then I just close the transaction out online and get it delivered to the house. That would be super ideal.